We are a little spoilt by having automatic cameras that do half the photographic thinking for us. Of course there is still plenty of room for creativity (I am no Luddite) but this can only be fully developed by knowing what is going on behind the scenes. And the best way to do that is simply by taking a historical view of the development of photographic equipment. In this article I'll explain how SLR cameras evolved to allow control over the lens aperture, something which is automatic and taken for granted today. The side benefit of obtaining this knowledge is that you'll be able to experiment with older lenses that don't do all the work for you. You may find a hidden gem and will certainly save money over buying contemporary lenses. There are four main types of aperture control: manual, preset, automatic and what we have today, which I suppose must be "more than automatic" or something. The earliest SLR lenses, say those designed for the M42 screw mount system, had an aperture ring with completely manual control. The usual technique was to frame and focus with the aperture fully open. The reason is simple -- the more light through the lens and into the viewfinder, the easier it was to see what you were doing. But generally one did not want to shoot the photograph with the lens at its maximum aperture. f/2.0 or f/1.4 might be nice in a pinch or for effect, but much of the time "stopping down" the lens achieved better image quality and increased depth of field so more of the subject was in focus. (For more on this, refer to my article A Primer On f-Stops and Apertures). Once you had stopped down, the camera's built-in meter (if it had one!) could set the appropriate shutter speed, assuming you were shooting in Aperture Priority (Av) mode. If instead you were in Manual mode, you could set the shutter speed yourself and a dial or series of lights might assist you in getting the exposure correct... or at least as correct as a dumb light meter can guess your intentions. All well and good, but moving between the aperture wide open (to compose the image) and the aperture at the setting you wished to shoot was a bit of a pain. With experience one would get a feel for the correct exposure in a given circumstance, but capturing rapidly moving subjects or changing scenes was a challenge. To solve this problem the "preset" or "pre-select" system was developed. These lenses have two aperture rings, as you can see in the photo above. The one to the left, nearest the lens mount, is simply a depth of field indicator. 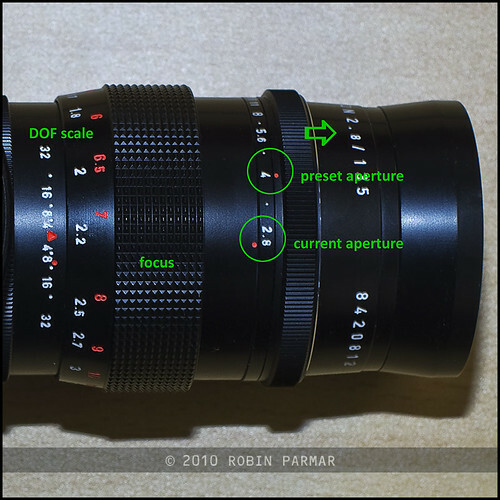 The aperture ring closest to the hood is the one you use, and it has two functions. 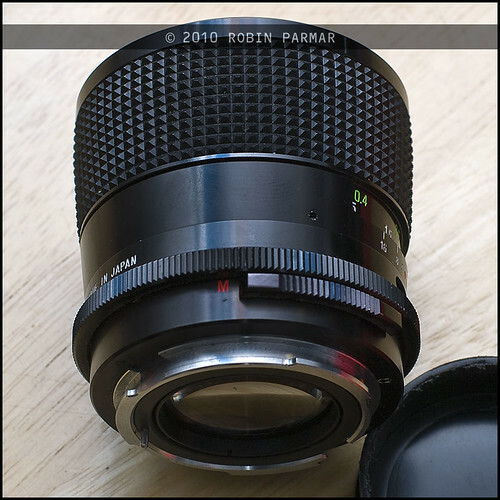 If you turn the knurled ring you adjust the current aperture of the lens. But if you move that ring away from you (in the direction of the arrow) while rotating, the preset aperture is altered instead. This actually does nothing to the lens diaphragm, merely providing a physical stop that prevents turning the aperture ring any further. This is an ingenious mechanical system that certainly confuses contemporary photographers when they first come across it! But in use it is simple. Move the preset indicator to the aperture you wish to use. Then you can quickly change the active aperture from that setting to fully open, without looking at the lens. 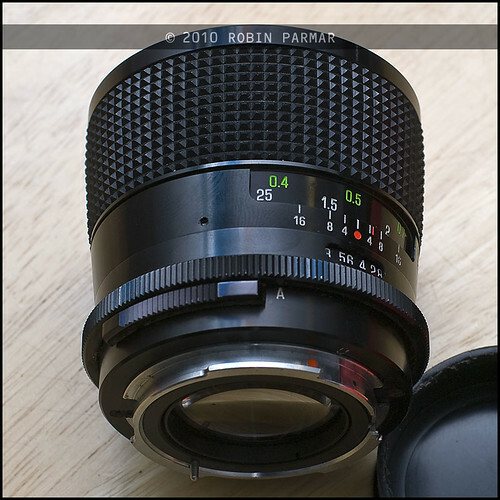 By the way, the lens illustrated above is the Pentacon 135mm preset, first manufactured in 1971 in the GDR. The second innovation was "Auto Aperture". These lenses had a spring to hold the aperture open and a small pin on the lens mount that, when depressed, stopped the lens down. You can see the pin at the bottom of the photo above. Thus the camera body could stop down the lens to the aperture manually selected. Otherwise that spring I mentioned holds the aperture wide open, for composition. Again, a simple mechanical solution to the problem. Further innovations in the camera body allowed depth of field preview without actually taking a picture. Whatever will the future bring! Pictured above is the very nice Vivitar Series I 28mm f/1.9, a solid metal M42 mount lens that can drive nails... and then take great pictures of them afterwords! And here follows the same lens with the sliding switch set to Manual. The next historical milestone was the development of electrical communications between body and lens. This facilitated shutter-priority mode and the sort of meter coupling I mentioned above. This was initially accomplished through the mount itself, but in this matter manufacturers reached the limit of what was possible with the universal M42 mount. In order to further automate their photographic systems -- and differentiate their offerings from the competition -- different brands adopted proprietary mount systems with custom electrical contact systems. That's how we ended up with different lens mounts for Pentax, Nikon, Canon, Olympus, etc. As a benefit, the proprietary systems implemented locking bayonet mounts that are a lot faster and easier to use than screw fit lenses. With fully automated body-lens aperture coupling, all of the choices you needed to make were at your fingertips on the camera itself. There was no longer a need for the aperture ring and so lenses designed exclusively for digital cameras have done away with them. It's hard to fathom that some of you reading this might never have used an aperture ring, but such is progress! I do hope that this little series will open some eyes to the possibilities and at least make it easier to understand what the old fogies are talking about. In a follow-up article I'll look at that Pentacon preset lens, which is a real beauty. But first I will write a backgrounder on the 135mm focal length. If this article has helped you, consider donating a small amount through the link in the sidebar. This will go towards our heating bill during this Irish deep freeze. As I write it is -6C outside... and about the same inside.